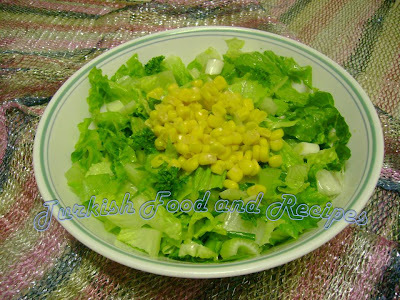 Except the sweet corn, place all the chopped ingredients in a salad plate or bowl. Add the salt, vinegar/lemon juice and olive oil. Mix them all and add the sweet corn on top. Misirlar haric, butun dogradiginiz malzemeleri bir tabak ya da kaseye alin. Tuz, sirke/limon suyu ve zeytinyagini ilave edip karistirin. Uzerine misirlari ilave ederek servis yapin.